Ran the first long term test at load today. 33 amps @ 53 vdc - I was running both banks for this test. I KNOW this is a bazaar looking way to test a DC power supply. I'm not sure I've ever seen anything like it before. But it's similar to a dummy-load for RF where there's a resistor in a gallon of oil I guess. 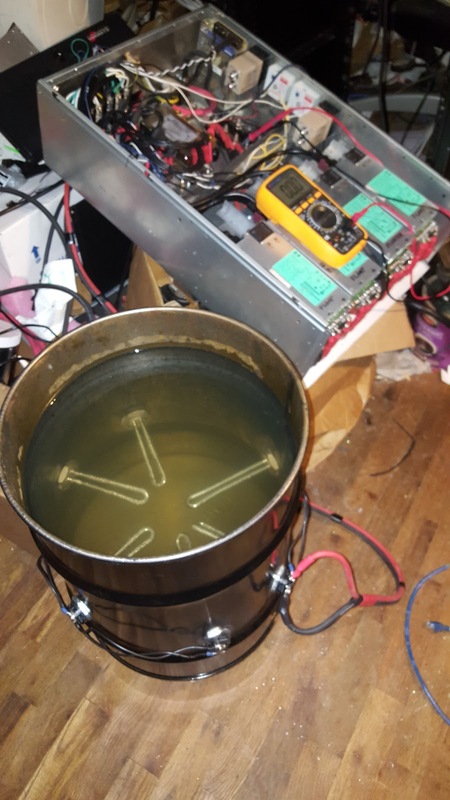 Except that these are 120v AC 1500 watt, 10 Ohm Heating elements (6 each) fitted into the sides of a 10 gallon barrel of water and wired all in parallel. Which results in about 1.6 Ohms of resistance @ 53 vdc. This test started with 76 F degree water. I ran the test until the temperature went up about 10 F degrees so about 86 F.
The 8 DSP-1200fb 13.5vdc power supplies running on 240v AC only reached about 76-80F degrees, and the fans barely came of idle during the entire 6-7 minute test. The only thing that didn't work as expected is the Ammeter on the face plate of the power supply controls. It was reading about 15 amps. While the Fluke Clamp meter was indicating 33 amps. So I'll have to figure out what's happening with that. Here's a Video of this test session. The next test I do will only running a single bank of 4 each 13.5 vdc supplies instead of the two banks of 8 total I ran today. That should stress the 4 supplies a bit harder, I think enough to run their fans off idle. To leak-proof I used "SIL 100 GP" silicone which is good to temp's of 450 F degrees! WAY overkill, but I had a 1/4 tube of this left over from some other project. I also used high-temp thread sealer for the 1" NPS Stainless Steel nuts that go inside the tank to retain the heating elements. I used a heating element socket (they're cheap and the best way to tighten them down). And a pair of vice grips on the inside holding the nut. This was all about as simple as can be. The hardest part of building this load tester was just cutting the 1"+ holes for the heating elements with a cheap set of 'step-bits'. And even that wasn't hard really. I may order 12 more heating elements now that I've seen that 6 of them barely heats the water 10 degrees in 6-7 minutes. With a total of 18 heating elements I should be able to get to 100 amps being drawn. That's where I want to be ultimately for testing this power supply. 10 Ohms / 6 elements = 1.6 Ohms. So 10 Ohms / 18 elements = 0.55 Ohms. Which would be close to 100 amps being drawn.